Here is the first translation into English of the complete Yin-Hai Jing-Wei, a classic fifteenth-century text on Chinese ophthalmology. As one of the few original manuscripts on traditional Chinese medicine translated into a Western language, this work offers an unprecedented view of the practice of medicine, and specifically eye care, in premodern China. 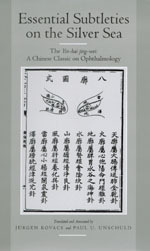 Superbly rendered from the classical Chinese and extensively annotated by Paul U. Unschuld and Jürgen Kovacs, the text provides detailed descriptions of the etiology, symptomatology, and therapy of every eye disease known to fifteenth-century Chinese practitioners. The translators' introduction also provides the first in-depth analysis of the development of this specialty within Chinese medicine. As a source for comparative studies of Chinese and Western medicine and numerous other issues in the history of medicine and Chinese thought, the Yin-Hai Jing-Wei has no equal in the Western world. Paul U. Unschuld is Director of the Institute of the History of Medicine, Munich University, and author of Nan-ching: The Classic of Difficult Issues (California, 1986), Medicine in China: A History of Pharmaceutics (California, 1985) and (California, 1985). Jürgen Kovacs, an ophthalmologist, is Research Fellow at the Institute of the History of Medicine, Munich University.